The 2018 Mid-American Conference Champion Northern Illinois University Huskies will take on the UAB Blazers, champions of Conference USA, in the 2018 Cheribundi Boca Raton Bowl in Boca Raton, Florida, NIU and the MAC announced Sunday. The game between the 8-5 Huskies and the 10-3 Blazers will be held at FAU Stadium in Boca Raton on Tuesday, December 18, 2018 at 7 p.m. ET/6 p.m. CT and will be broadcast on ESPN. NIU’s invitation continues one of the top bowl runs among any non-autonomous conference team in the country as the Huskies will make their 10th bowl appearance in the last 11 seasons, a record of success matched only by Boise State. The Huskies will play in the Cheribundi Boca Raton Bowl for the second time in school history as NIU appeared in the inaugural game in 2014 versus Marshall. Tickets for the Cheribundi Boca Raton Bowl will go on sale through the NIU Athletics Ticket Office beginning later today for $57 each, and will be allocated according to the Huskie Athletic Fund benefit process. The tickets can be ordered online through NIUHuskies.com link now and beginning Monday, December 3 at 9 a.m. (CT) by calling 815-753-PACK (7225). Fans who cannot attend the Cheribundi Boca Raton Bowl but would like to donate purchased tickets to the partnered charitable organization, please select “Donate Tix” as your delivery method. Huskie fans are encouraged to purchase their tickets through NIU. The Huskie Athletic Fund Priority Seating deadline is Friday, December 7 at 5 p.m. Seat locations are assigned based on 2018 annual giving level with Huskie Athletic Fund donors who are also football season ticket members receiving priority before non-season ticket members within their giving level. Tickets will be available for in person pick-up in DeKalb at the NIU Convocation Center during normal business hours, beginning Monday, December 3 through Wednesday, December 12 at 5 p.m. After that time, tickets purchased through NIU will be available in Boca Raton at times and location to be determined. Fans who purchase tickets prior to the priority deadline on Friday, December 7, may request to have their tickets sent via express shipping for an additional $10 charge. Those tickets will be shipped on December 11. NIU will offer fan packages for the Cheribundi Boca Raton Bowl through the NIU Alumni Association. For information on available packages, go online to www.myniu.com/bocaratonbowl. Check back as the page will be updated as more information becomes available. 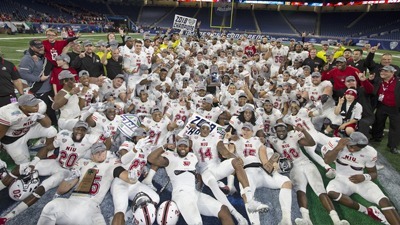 NIU is coming off a thrilling 30-29 comeback victory over Buffalo in the Marathon MAC Championship game at Ford Field in Detroit as NIU claimed its fifth MAC title. The Huskies, who played one of the most difficult non-conference schedules in the country – taking on Iowa, Utah, BYU and Florida State – before winning its first six league games en route to the MAC West Division crown and the championship game. NIU, which leads the nation in quarterback sacks, is led by All-American defensive end Sutton Smith, who leads the FBS in that category. The Huskies have won six one-possession games and have held opponents below 30 points in nine straight games. Champions of Conference USA, the UAB football team is making its third bowl game in school history. This will be the first meeting between NIU and the Blazers, who finished the season with a program best 10-3 overall record and 7-1 in C-USA. UAB ranks 10th in the nation in total defense and 66th in total offense. C-USA Championship Game MVP Spencer Brown leads the Blazer rushing attack. The sophomore tailback averages 88.4 yards a game and has amassed 1,149 yards on the season.